In 1997, the Strnad family in Milwaukee found an envelope bearing the Nazi seal while cleaning out their mother’s basement. Inside was a letter from 1939 written by Paul Strnad. Paul asked his cousin Alvin to help him secure an affidavit for he and his wife, Hedy, to escape Nazi-occupied Czechoslovakia. Paul explained that Hedy was a dressmaker and included eight of her designs as proof of her talent. Paul and Hedy did not survive the Holocaust. But her dress designs did. Realizing the letter’s significance, the family donated it to Milwaukee’s Jewish Historical Society. When the Jewish Museum Milwaukee opened in 2008, it became part of its permanent collection. In 2014, the museum worked with the Milwaukee Repertory Theater to bring Hedy’s designs to life. The resulting exhibit, Stitching History from the Holocaust, is running at the museum through February, 2015 and will then be touring the U.S. 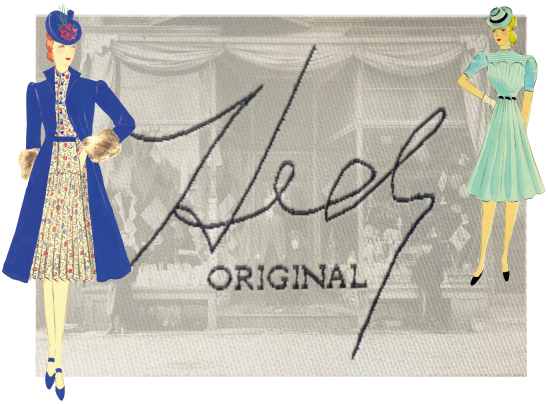 This digital exhibit allows visitors all over the world to learn about Hedy’s story.